Comparatively the efficiency of the Corsair CX400W PSU is bottom of the tables where it matters - like we said, it's understandable given it's also cheaper than everything else above too, and it's not that much more inefficient, but there is clearly a factor of getting what you pay for. In our opinion, the CX400W is efficient enough considering its low wattage and cost efficiency, but we won't ignore the fact that higher efficiency generally correlates to "better" internal hardware. Corsair has done a great job of deciding what to include and what not to include to keep the costs of its 400W power supply down. Bundled extras have been kept to a minimum and there's no flashy branding or blingtastic fans either - it's a minimalist approach we know our readers will appreciate, but it could also be argued by some that it's somewhat boring. The PSU has a nice slightly textured finish and braided cables that stretch the full length to keep things looking neat. If we were to be fussy, then the cable braiding could have been a little tighter, but for the kind of build people will using this PSU for, it's not the end of the world. 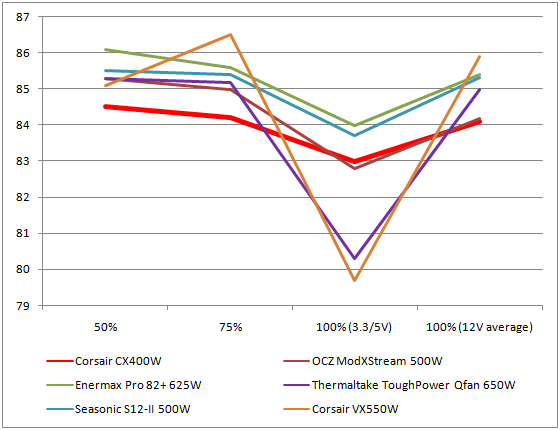 Compared to other non-modular 400W models on the market, the Corsair is competitively priced. If were after a 400W modular PSU made by an established company you'd be looking at spending another £20 or so on a model such as Enermax's 400W Liberty. If the modular tickbox wasn't high on your list of priorities but you needed some more juice then perhaps Corsair's VX 500 would be more suitable which costs around £30 more than this 400W model. If you needed more power than the Corsair offers but you're already at your price limit then you could bag a 500W OCZ StealthXStream for just a few a quid more from Ebuyer. The Corsair includes a three year warranty, which might be a couple of years less than many PSUs on the market these days, but if you keep this model for three years, we feel that you'd get your £45's worth. The three year warranty is the same as the excellent Seasonic S12II and also Enermax's liberty PSUs. However, if a three year warranty doesn't sit comfortably with you then Corsair's VX550W is five years, as are CoolerMaster's and Antec's PSUs who also generally make quality products. OCZ's ModXStream PSU has a three year warranty, but beneficially includes their power swap replacement programme, which cuts out the long downtime of having to wait for an RMA replacement. No one else in the industry matches this right now, so whether you want to pay the extra for the OCZ or just take a standard three year from Corsair is up to you. The Corsair CX400W PSU is a quality bit of kit. It consistently remained above 80 percent efficiency, closer to 85 percent at higher loads and even survived our full load stress test, not to mention the consistent set of green results across the board in the voltage department. Technically though, it was the least efficient of the low wattage PSUs we've seen but only by a very small small margin and considering this is the cheapest PSU we've seen, this fact is forgiveable. It's a shame that the ADDA fan isn't quieter under higher loads, but looking at the components used to manufacture the PSU and Seasonic's clear influence in the design (despite Corsair's insistence it's "its own" design) and Seasonic build quality. Given this, compared to the S12-II 500W which now costs about £25 more, you're getting a lot of PSU for your cash. The CX400W would make an ideal power supply for a budget build, or a system that doesn't execute many demanding tasks such as a file server, low power media centre or a home office PC. That having been said, the lack modular cables will make it less suitable for a small form factor chassis. If your next build project only requires a little oomph to get the job done, then you'd be hard pushed to make a better purchase for the same price.